Please help me compile a directory of Bay Area chefs and restauranteurs who have made a committment to using locally sourced, sustainable produce in their restaurants. If you have any suggestions for restaurants that qualify - please leave them in the comments section, thank you. Piatti Locali,625 Redwood Highway, Mill Valley, CA 94941. Maybe you won't like the idea of dining in a restaurant that has expanded into a nationwide chain. But you may be interested that Piatti, which grew out of Napa, have turned one of their branches into Piatti Locali which puts an emphasis on using sustainable local produce from the farmers' markets. Fred and I had lunch at Piatti on Tuesday. 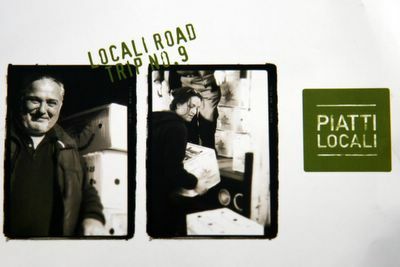 The walls of the restaurant are decorated with stylish black and white photographs of the staff, the farmers, the farms and the markets. The Piatti Locali menu is scattered with references to local farms. I tried to ask the waiter about the source of ingredients not singled out on the menu. He wasn't very clued-up. He told me all of the pasta was made in house. "Even, the spaghetti? ", I asked, clearly surprised. "Yes, all the pasta," he assured me. This made me suspicious, so when I was rooting around on their website for information and saw they had a comments section, I decided to write to the chef and see if she would answer some questions for me. I had a lovely and heartfelt reply from Lissa Kane the Locali Executive Chef which I would like to share with you all. Pasta: we make angel hair, pappardelle, tagliatelle and cannelloni. Spaghetti and penne are from Italy. Flour: we use Giusto's flour. I believe the wheat is grown in the Midwest, I will follow up on it. Prosciutto, Extra Virgin Olive Oil, Balsamic Vinegar & Grana Padano (parm) are all imported from Italy. Ricotta: I use two brands depending on availability: Calabro from Connecticut & Bellwether Farms in Marshall, CA. Thanks for making me research some of our 'basics'. I shop at the Farmer's Market 2x a week both in SF and San Rafael, so I am very aware of our produce. I try to buy locally caught fish and locally raised poultry and meat. I just got some samples fr m Niman Ranch for some salami and speck (an alternative to Prosciutto di Parma). I also serve a few types of local artisan cheeses - please try our cheese plate complete with house-made locally grown fig 'salami'!! The email was good news for anyone who is interested in eating from local sources. When I was at Piatti, it felt a little as if, maybe, they were just jumping on a bandwagon. But when I received the email from the Chef it was clear that the good intentions and the passion behind the move to a 'locali' restuarant were genuine. Piatti Locali is situated overlooking the 101, but once inside, the view, over a stretch of water with Mount Tam in the background, is far more attractive. Food is Italianesque. I tried the Niman Ranch Beef Carpaccio which was a classic interpretation of the dish. On the side I had the seasonal special - two delicious, fat, deep fried squash blossoms filled with a zingy herbed ricotta, a bargain at less than $5. Fred had a margherita pizza with pepperoni from their wood burning oven which he concluded wasn't very tasty. Lissa Kane is hosting a special 'Dinner in the Garden' on Saturday, August 27, at County Line Harvest in Petaluma. She is planning an Italian inspired feast featuring produce picked that day from the farm. The idea is to eat in the field where the products are grown. There will be a tour of the farm at the start of the evening. She plans to serve grilled California Wild Salmon and Roasted Prather Ranch leg of lamb as well organic Bonterra wines. The cost of the event is $100 a person all inclusive. If you are interested in the dinner contact the restaurant. Yesterday's eating local challenge went extremely well. Aside from a couple of cups of tea, I feasted solely on local goodies. Fruit and cheese for breakfast. Lunch at my favourite Tabla, and a dinner of sweetcorn omelette, salad, cheese and Fatted Calf charcuterie. Goody, goody, two-shoes me. Archive Alert! On this day in 2004 we were celebrating the birthday of one of my best friends at Roe. She lives in LA now, so we're flying there tomorrow to see her and wish her another Happy Birthday! I love that this came from a restaurant that is part of a larger chain. I am really finding it frustrating when a chef has gone to the trouble of working out specific sources of food and the staff isn't trained to understand the importance of those sources. Chefs can do all the work they want, but if the servers don't care then chances are the message won't get to the patrons. This is a great result! We're going to have to go to Piatti! Thanks for the excellent foodie detective work, Sam! I've seen the restaurant so many times from the highway, and never felt tempted to try it until this review... it is heartening to know that someone inside truly cares. Wow, I've been avoiding Piatti too. Hadn't realized they'd fine-tuned their approach. Poggio is a classic Italian trattoria with comfortable neighborhood charm and destination-caliber cuisine. Using the best available local ingredients and property-grown organic herbs and vegetables, the daily changing menu features soulful classics of Northern Italy, simply and earnestly prepared. Hi - This is the first time I've commented, so let me say that I really enjoy your blog - especially the restaurant reviews since I live in Marin County. Jen - you have a good point that it is great to see a chain make this kind of move. It is an investment that many single restaurants can't afford to make. Jennifer - UI hope you enjoy it - Can we look forward to reading about it on your new blog? Cookie Crumb - hey I should be getting commission for all these referrals! Sausalito is just a bit too far for my lunch adventures, but maybe when my work moves to the Presidio I can try it (if its worth the $5 bridge surcharge? Johnathan, thank you for visiting and commenting. Thanks for the headsup about barndiva. I am going to check out their website. I am afraid my Marin reviews will be dwindling off shortly because my company is moving to the city. When that happens - I will point everyone in the direction of a growing bunch of Marin-based bloggers who are doing an equally good job. How about the Warming Hut in the Presidio or Desiree? Here's one of my favorites for the list: Slow Club! Well, this whole Eat Local Challenge has dovetailed beautifully with my love of small farms. I managed to hit up FIVE farmers markets last week (National Farmers Market Week), and I talked to a lot of farmers about the challenge. This morning, I e-mailed some of my farmer friends to ask, "Who buys from you in the Bay area?" Here is Joe's list...for starters. I will be adding to it, and probably re-organizing it as I go along. Someone has already posted some follow-ups that include places in Marin. Hey, why don't some of you nifty kids come over to MouthfulsFood.com, anyway? It's fun, and we could always use fresh (local, seasonal, sustainable) blood. I love Comments on restaurants because it is difficult to find a good restaurant in your city.